The Samsung Galaxy Note8 has been officially unveiled today in New York. The device sports a 6.3-inch Infinity Display, which is a nearly bezel-less, edge to edge curved screen, with rounded corners. The screen is an always on Super AMOLED display, with a Quad HD resolution of 2950 x 1440 pixels, at 521 PPI and has an aspect ratio of 18:5:9. The device runs on Android 7.1.1 Nougat, and features an S PEN which is IP68 certified for water and dust resistance, just like the phone itself. 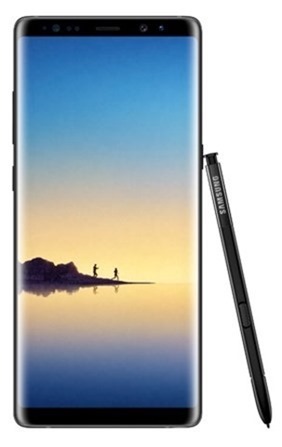 The Note 8 supports Edge Screen with Edge Panel customization, screen off memo, Bixby Vision, among other software features. The Note8 is powered by a 10nm octa-core Exynos 8895 processor clocked at 2.35GHz (Snapdragon 835 processor for the U.S) with 6GB of LPDDR4 RAM. The device comes 3 storage variants: 64GB/128GB/256GB. The phone will be available in Single SIM and Dual SIM variants, but both models can only have one Nano SIM card and one microSD card at a time, with the only exception being you can use two Nano SIM cards with the Dual SIM variant. The Note8 has dual cameras which are of 12 megapixels each, and both cameras have Optical Image Stabilization (Dual OIS). The cameras offer 2x optical zoom and 10x digital zoom, and supports dual capture, HDR, and live focus. The main camera is a telephoto lens with an f/2.4 aperture, a 4:3 sensor ratio, a 45° FOV, 1.0µm pixel size, and a 1/3.6" sensor size. The secondary camera is a wide angle lens with a 1.4µm pixel size, 4:3 sensor ratio, 1/2.55" sensor size, a 77° FOV, an F/1.7 aperture, and support for Pro mode, Panorama, Slow motion, Hyperlapse, Food mode and RAW file. The device supports 4k video recording @30fps, 1080p videos at 30/60fps, 720p videos at 30fps, and supports VDIS (video digital image stabilization), high CRI LED Flash, hyperlapse video, and slow modion video in 720p at 240fps. The selfie lens on the Note8 is an 8 megapixel front camera with auto-focus, an f/1.7 aperture, with a pixel size of 1.22µm, a sensor size of 1/3.6", a 4:3 sensor ratio and an 80° FOV. In terms of connectivity, the Note8 supports Wi-Fi 802.11 a/b/g/n/ac (2.4/5GHz), Bluetooth v5.0, ANT+, USB Type-C, NFC, Location (GPS, Galileo, Glonass, BeiDou). The Samsung Galaxy Note8 is backed by a 3300mAh battery which supports fast charging on wired and wireless modes. The Note8 has a fingerprint scanner on the back panel, and an iris scanner on the front for biometric authentication to unlock the device. There is a Bixby key for accessing Samsung's assistant baked in to the OS. The device has the following sensors: Pressure sensor, Accelerometer, Barometer, Gyro sensor, Geomagnetic sensor, Hall sensor, HR sensor, Proximity sensor and an RGB light sensor. The Note8 measures at 162.5 x 74.8 x 8.6 mm and weighs 195g. The S Pen measures at 108.3 x 5.8 x 4.2 mm and weighs 2.8g. The Samsung Galaxy Note8 has a 3.5mm audio jack. The Samsung Galaxy Note8 will be available in 4 colours: Midnight Black, Deepsea Blue, Orchid Gray and Maple Gold. The Note8 has a lot of accessories such as the DeX dock, a Clear View Standing Cover which can hold the phone in an angle for viewing media, an LED View Cover which can display notifications and the time, a durable alcantara cover, a QWERTY keyboard cover and some other cases which will be sold separately. The Note8 will be available from September 15th, and pre-orders will begin shortly.